(Three of) Robocobra Quartet. A bad photo. The front room of the Stag & Hounds is well known as a punk venue in Bristol, but apparently they sometimes run gigs concurrently in a tiny upstairs room. So it was that we walked in to a punk show raging, with a sign informing us our gig was upstairs. We passed the sound man on the stairs. “Are you here for Steve Strong?” he asked. “I’m a little worried about the sounds from downstairs, because what he does is so delicate, you know?”. Uh-oh. I hadn’t heard Steve Strong before, but I knew there was a guitar, beats and a loop pedal involved, and I was beginning to fear he would be another one of those songwriters who make you wait seven minutes while they patiently set up loops of handclaps before playing their dull dull song that didn’t really gain anything from the handclaps anyway. I needn’t have feared. In fact, it’s fair to say delicate is the last adjective I would have used. Perched behind a drumkit, Steve Strong laid down some wonderfully textured loops on his (electric) guitar, before launching into a battery of live beats that was as impressively intricate as it was loud and energetic. This is some seriously enjoyable stuff. 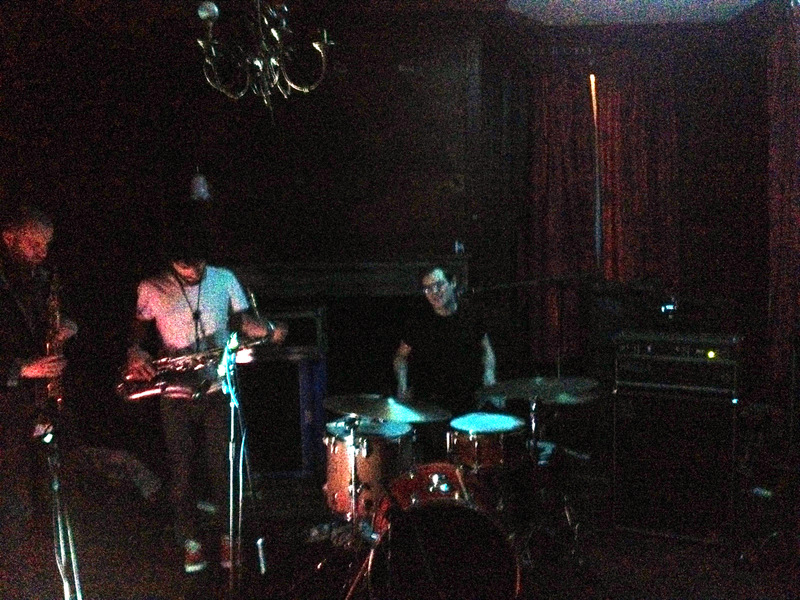 Robocobra Quartet hail from Northern Ireland and continue the all eyes on the drumkit theme of the evening. Singer/ drummer Chris Ryan thanks us for making it through a room, up the stairs, past the toilets and up some more stairs to see them. The overall feel is quite jazzy, with bass and drums driving their songs with two saxophones and Chris’s spoken/ yelled vocal delivery recalling hints of Conor Oberst and lending a punkier element to the music. Lyrically, there’s a dry humour at play, but on stage we’re treated to a warm wit – at one point Chris observes of the punk music emanating from the room below ‘I don’t know if we should be playing with or against them’. This was a great performance, and bodes well for bigger things such as SXSW next year.